For full details on the discoveries on Mars, there’s a Universe Today article written by Nancy Atkinson, or an article direct from Science@NASA. I’ll bet those NASA scientists are jubilant. This discovery must be like a holy grail to them! 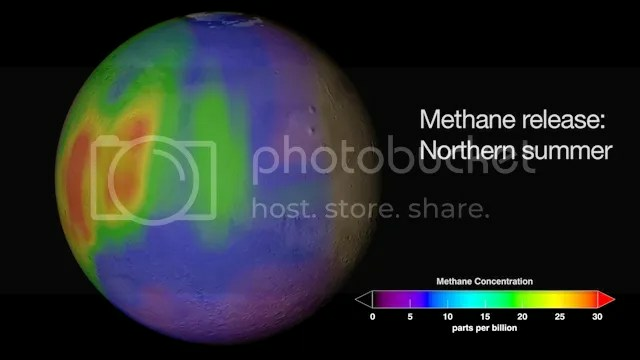 So, to cut a long story short, three “hotspots” in the Northern hemisphere of Mars, just above the equator, have been shown to be emitting plumes of methane gas (discovered via spectroscopy!). Specifically south-east Syrtis Major, Nili Fossae and Arabia Terra (in case you happen to have a map of Mars handy). Areas which once upon a time, had copious water. The thing is, methane is quite rapidly destroyed by ultraviolet light, meaning that any noticeable amount of methane on Mars wouldn’t last more than about 340 years. Over the lifetime of a planet, that’s barely the blink of an eye, so the only logical explanation is that there’s a continual supply of methane. A significant amount of methane, at that. What’s more, the effect seems to be seasonal. In the martian summer, more methane is emitted. Subsequently, the gas apparently dissipates faster than sunlight alone can reasonably explain. A huge disequillibrium in a planet’s atmosphere like this means, very simply, there’s something going on that we don’t understand. And that’s exciting. In my opinion, not being able to explain something is the most exciting part of planetary exploration! Whatever happens, we’ll discover something. And there are only two possible sources of methane gas on planet Mars. Geochemistry or life. Amazingly, as far as I can make out, they both seem equally plausible! Olivine, carbon dioxide and water go in – serpentine, magnetite (a form of iron oxide) and methane come out. The constraints on this mechanism on Mars would be the lack of any obvious geologic activity. Mars’s tectonics seem to have long since seized up, leaving the quesion of how enough olivine would come into contact with enough water to cause the huge amounts of methane seen. Without any geological activity to sustain the reaction, all olivine surfaces would eventually become coated in serpentine. It’s a self-limiting process. If this is the source of the martian methane, it would mean that Mars isn’t geologically dead after all, which would be quite a revelation in itself. Another possibility would be methane clathrate. Found on some of Earth’s ocean floors as well as several icy moons, it’s a form of ice with methane molecules trapped inside it. 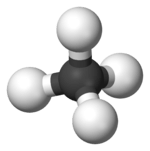 Melting this clathrate could cause a release of methane. Any stray non-melted clathrate would float to the surface (it’s still ice, after all), and/or the water would seep away. This would allow more clathrate to be exposed to the surface, replenishing the supply. The big news in this is simple: if seasonal warming can cause subsurface clathrate to melt, then there could well be liquid water somewhere beneath the surface of Mars. I should note that this mechanism is my own inference. There could be a good reason I don’t know about why this isn’t possible — though I can’t think of one. Mind you, I have no idea how long such a reservoir of methane might last. This is a method used by, among other things, subsurface microbes on Earth. Buried beneath Africa, radioactive minerals split water molecules into oxygen and hydrogen. Methanogenic microbes there use that hydrogen to create methane this way, existing without even needing sunlight (a different kind of microbe, incidentally, to the ones I’ve written about previously). The idea seems decidedly plausible. Another thing that falls out of this idea is that if methanogenic microbes exist, then another type of microbe may exist, called “methanotrophs”. Methanotrophs use the opposite reaction, effectively breathing in the methane and exhaling CO2. Even though they aren’t fully understood, microbes like these also exist on Earth’s ocean floors, using the methane there because there isn’t enough free oxygen available. Anaerobic respiration, in other words. A bloom of methanotrophs on Mars could conceivably explain the rapid dissappearance of the martian methane clouds. In effect, there could be an entire ecology around Mars’s equator, based around methane. So we could well be looking at the first good evidence of life on another planet (ignoring a certain meteorite). That’s just a huge concept. Mindblowing, in fact. I do know one thing, though — I can’t wait for NASA to release more data on this! In case you’d like to read it: The NASA Press Release. This entry was posted in astrobiology, chemistry, Imported from Livejournal and tagged mars, planets. Bookmark the permalink.